My mom started to get sick this past Thursday and was progressively getting worst. So, I wasn't too shocked when I got the call on Saturday morning that my mom wanted to go to the Emergency Room. I found someone for the girls and took her. However, her and I were both completely shocked when they came back with a diagnosis. What we thought was the flu was actually something a little more serious. I'm going to keep the actual diagnosis private to respect our Nana but it required an immediate hospitalization. She ended up spending three days in the hospital. She was released yesterday after heavy doses of fluids and antibiotics. And the promise of follow up testing. That I will be sure is completed. The girls actually enjoyed visiting Nana in the hospital. When Aunt Tammy works at the hospital, it's endless ice cream, cookies, and Sprite. 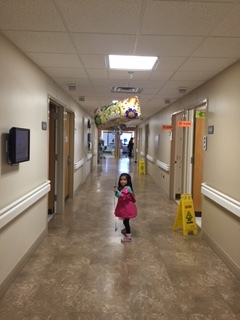 We picked out a big balloon from the gift shop and delivered to Nana. We're definitely glad our Nana is better!